Please email us or call 714-988-0001 with any questions or to request pricing. 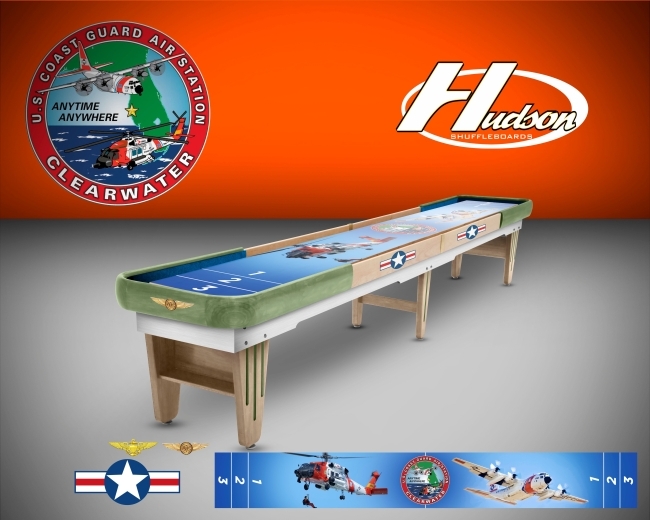 This custom artwork covers the entire playing surface on the 22' shuffleboard for Venice Town Hall. The horse-collar features Red Italian Hornback Leather to go with the Spanish Oak stained cradle. 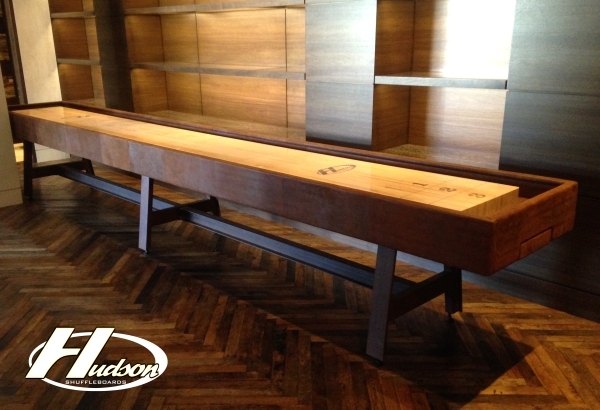 This custom 18' shuffleboard table is based around the custom fabricated A-frame legs with a Japanese brown patina finish. Every square inch of the cradle was wrapped in custom sheepskin leather. For a finishing touch, custom drawers were added on each end of the cradle to store the playing weights. Made 100% in the USA. Available in 9'-22' lengths. 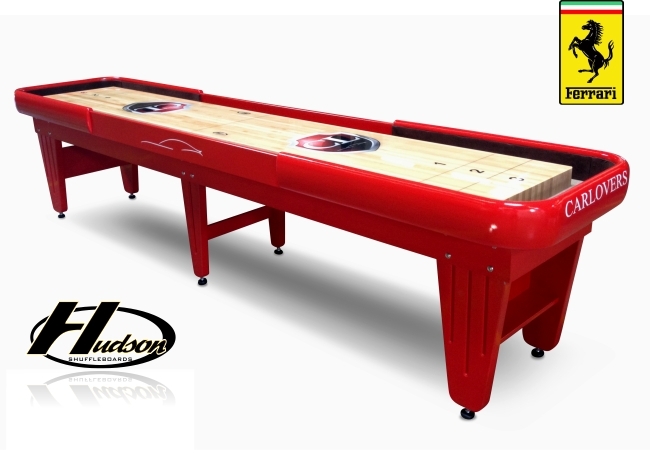 This custom 16' shuffleboard table is based around our custom fabricated Metro shuffleboard which features a powder coated cradle and legs. 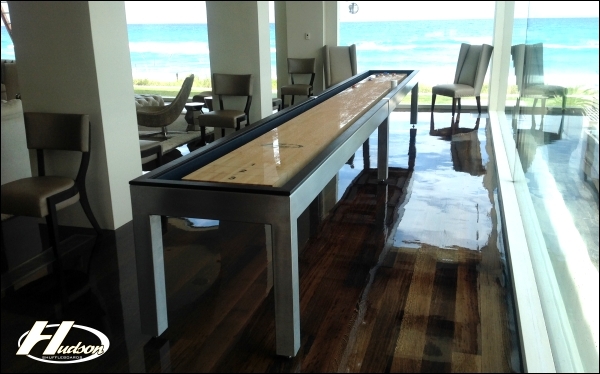 For multi-purpose use, this shuffleboard included a custom stainless steel top elevated to bar height with acrylic panels and drink holders added. Made 100% in the USA. Available in 9'-22' lengths. 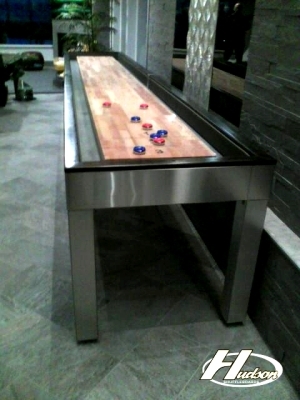 This custom fabricated 22' shuffleboard table is arguably the best shuffleboard ever made. Featuring a brushed stainless steel cradle and legs, our customer's requirements included no seams in the legs, meaning each of the welds had to be polished then hand sanded to ensure the grain on the brushed stainless went in the same direction throughout the table. The top rail on the cradle features quartersawn wenge wood imported from Africa. To top it off, the interior walls and bed of the cradle were detailed in genuine leather imported from Italy. 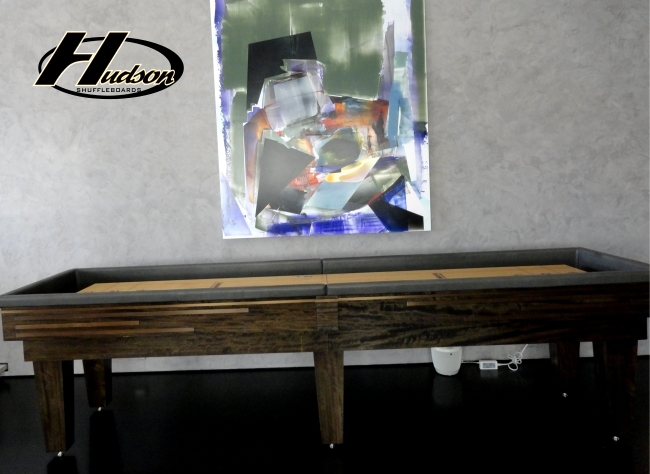 Made 100% in the USA, this custom table is definitely a show piece. Available in 9'-22' lengths. 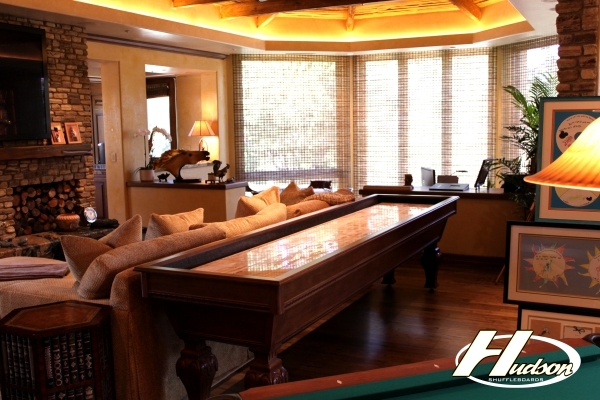 This custom hand-crafted 14' shuffleboard table was designed to match the look and finish of the customer's existing pool table. Constructed from 100% solid maple and made right here in the USA. Available in 9'-22' lengths. 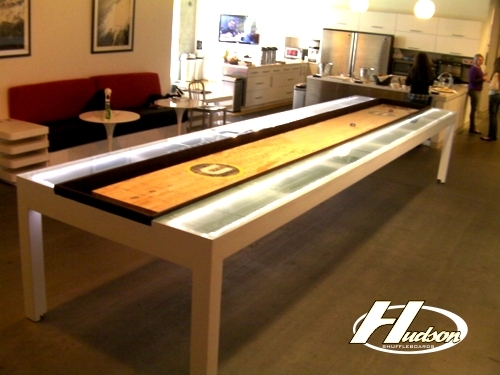 This custom fabricated 22' shuffleboard table was designed to double as a shuffleboard and work table. Requirements included a tempered glass top elevated to bar height and four receptacles on the interior sides of the legs which provides employees the ability to work on computers. The table was installed on the 7th floor which played a part in the design and assembly process. 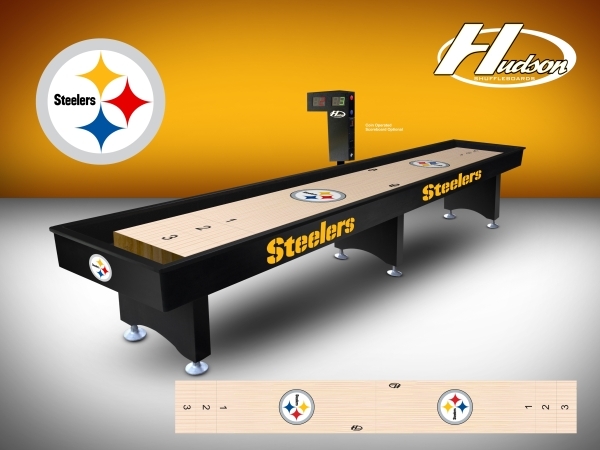 For the finishing touch, the playing surface featured the company's logo. Available in 9'-22' lengths. 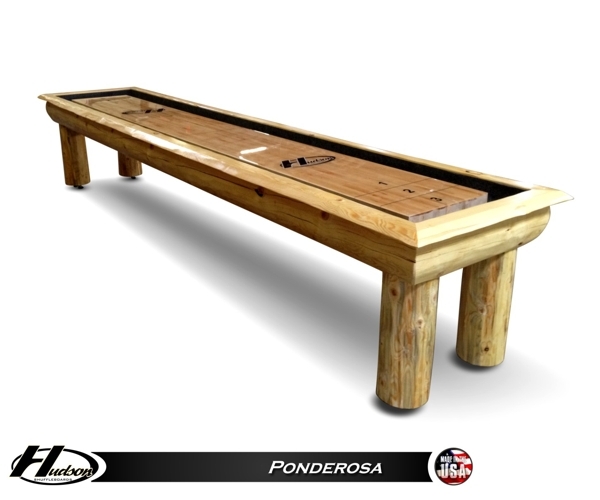 This custom hand-crafted 14' shuffleboard table is constructed from environmentally farmed solid teak wood and made right here in the USA. Available in 9'-22' lengths. 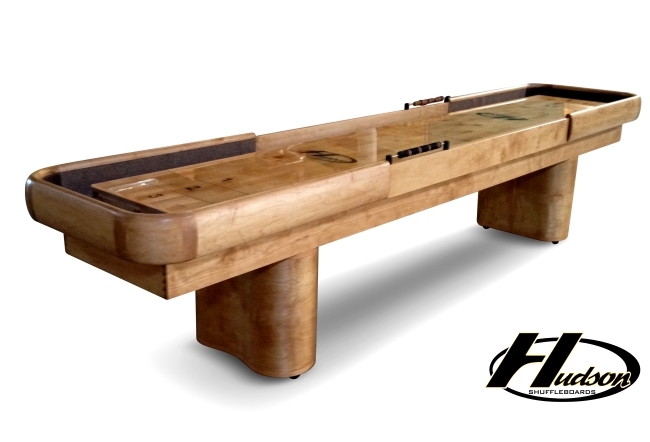 Made 100% in the USA and constructed of solid maple, this custom 11' shuffleboard was built to match an existing pool table. Now the centerpiece of the room, this table features a solid maple cradle with decorative trim and custom legs. The playing surface also features custom logos. 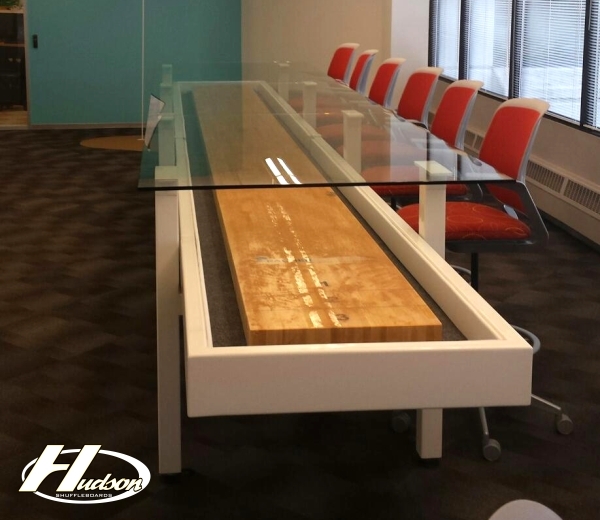 Customer Requirements: 18' Shuffleboard to Serve as Board Room Table. 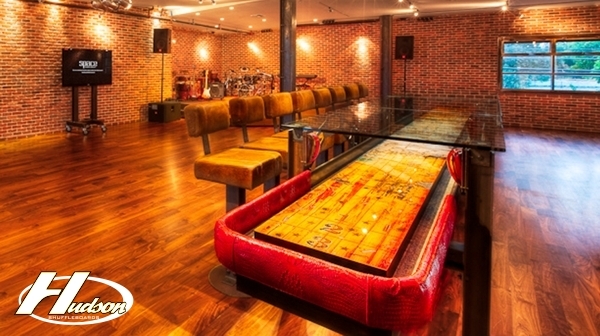 Must Have Steel Structure with Powder Coating, Custom Leather Interior, Custom Carpet, Acid Etched Glass with Diffused/Dimmable LED Lights, Custom Logo on Table and Weights, Power Outlets on the Bottom of the Table to Plug in Electronics. 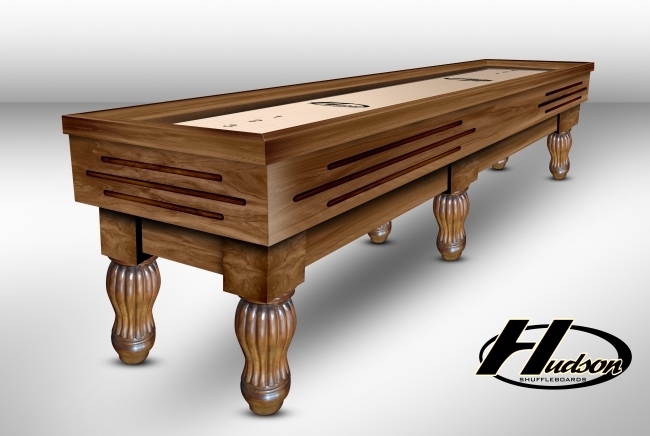 In addition, we had to make this table fully adjustable so it not only looks awesome, but plays great as well. 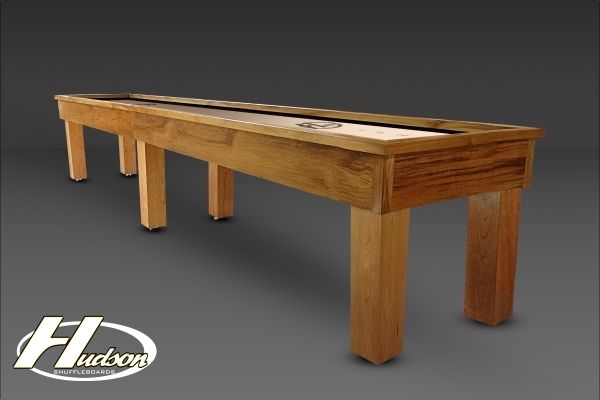 Customer Requirements: 16' Metro Shuffleboard featuring an upgraded stainless steel cradle and a Solid Walnut top rail finished with a custom stain. 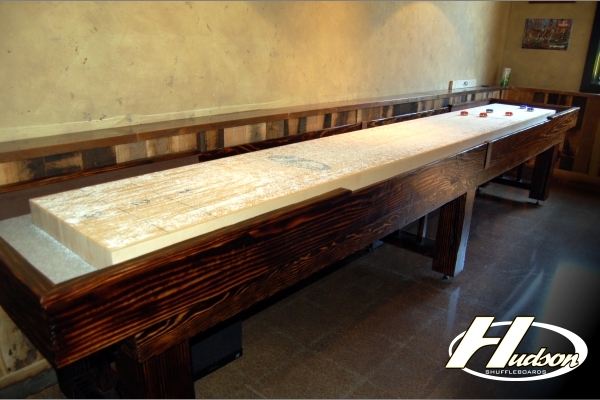 Customer Requirements: 14' Hand-crafted distressed shuffleboard featuring kiln dried fir with an espresso stain. For the final details, the cushions lining the ends of the cradle as well as the seam plates were wrapped in genuine leather. 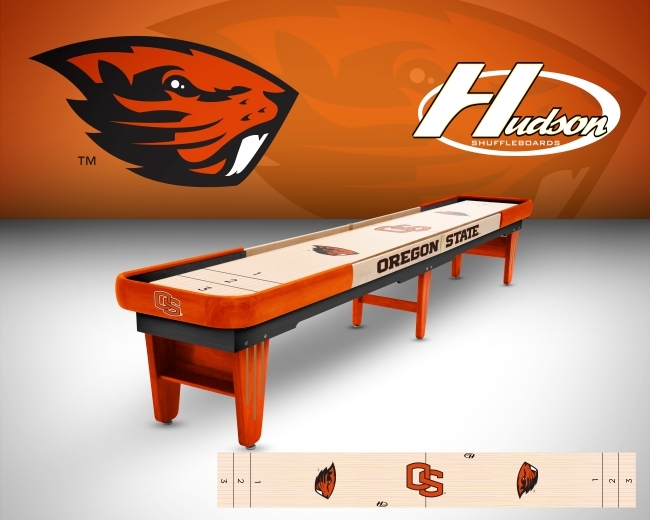 Customer Requirements: Based off our Intimidator model, this hand-crafted shuffleboard designed for Oregon State University, features custom stains and decals to fit right in at OSU. Made 100% in the USA!